This is somewhat of a tutorial and is picture heavy. If you have trouble viewing the pictures here then try this link to my facebook page that has the pictures all together in one album. Ok, abusive yes, but the shoe dollhouse still appealed to me even if the story made me wish I could help those poor children! a fascination with that shoe dollhouse. And not too long ago I saw a leather boot on pinterest (look for my miniature board) that someone turned into a dollhouse and I instantly thought I could do that too! So off to the thrift store to find a pair of leather boots and I found them! They are vintage leather boots made in England by Bally. Next, I cut one to expose the inside of the boot then I removed the lining. Using a hot glue gun and pieces of a cereal box I re-lined the inside. This made the leather stand up on its own. I then covered that with thin poster board to get a flat, clean surface. I then got a super great idea and off to the thrift store again and got a vintage song book. Again, using a paint brush and modge podge glue I went to work and covered that pink paper with the song book paper! Ok, so now you see I jumped a step in the picture above. I got carried away and forgot to take pictures of the floors going in. But all I did was use paper to make a template and then transferred those templates onto cardboard and cut out 2 boards for each floor. So I had 2 boards and glued them together to make the floors sturdy. I then glued down my paper flooring that I printed off from this site , (go to wallpaper then to wood Brick and Floors). I then hot glued around the cardboard edges that fit inside the boot and held the boot firmly with my hands as the glue dried for each floor. Hot glue dries fast! 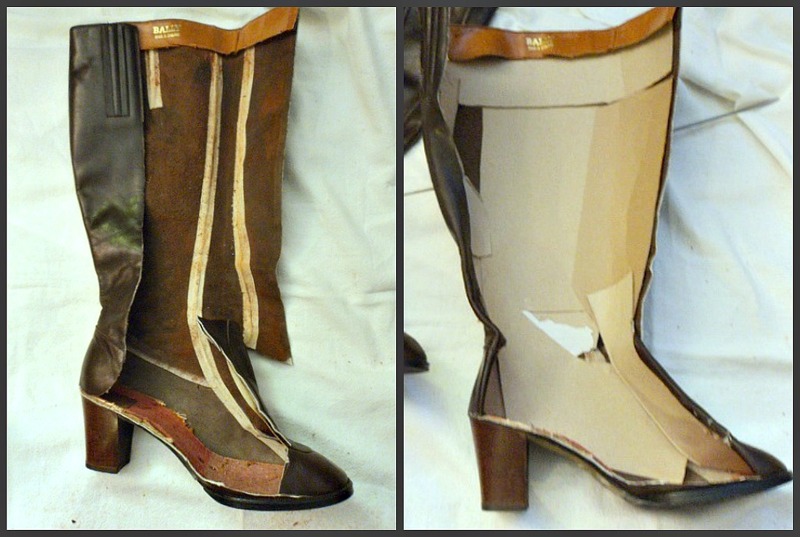 Once those were dry and sturdy I cut leather strips from the other boot and outlined the open edge of the floors. I really never had a plan for any of this, I only had a general idea which always turns out great I find... just letting go and building on ideas as they come to me! I decided to use cardboard again and made a little peaked roof and edged the front of it with leather strips off that other boot. Once I got that done I really wanted a textured feel to the roof itself. I tried all sorts of ideas then I came across this old leather bible that I was saving for crafts and *Wa La* I had my roof! The covers, once cut from the binding, fit perfectly as if it was meant to be! OH wow, I just love the look of it too! I wanted wooden stairs but I'm no carpenter and tried different things to build them and finally decided to use these wooden blocks my son no longer plays with. I had saved them for crafts and I'm so glad I did! And again, I used hot glue and built up the stairs, once they were dry I sawed off the ends and then painted them black with acrylic craft paint. I did glue them right to the heel of the boot to make the boot stable. They turned out great!! Ok, all done I think! I'm very happy with the final results. I hope I've inspired you to make one of your own and that I've given you some tips to help you along. If you have any questions please don't hesitate to ask... below are the finished pictures and I'll be posting again once I have a little family to move in and furnish the place! UPDATE: Click here for pictures of this boot full of furniture! What a lovely idea, it's so cute! I'm in love! I definitelly have to try (even if I don't have children)! Ingenious! I'm going to have to try this now!!!! What an AWESOME talent you have! Thank you Karen! I love building, fixing, decorating! I have ideas for windows and I'll be making some ladders too. I'll post more pictures as it progresses. Good luck in your project. If you build one please share pictures on my facebook page, I would LUV to see it! This is AMAZING, I would love to see the space under the heel become a wine cellar or crawl space. Absolutely gorgeous idea, so creative and I love a good recycling project. Thank you Ruby! Those are great ideas... I was planning something because we have a tiny bike and some other outdoor stuff that will need a place. This will be a long project, because everything so small I am making all the furniture. So far I have a twig bed, a bookcase and a kitchen sink made! Fun! I am currently thinking of ways to get some stairs or ladders into the boot before someone moves in! This answers the question: "What do I do with those boots that I don't wear anymore. 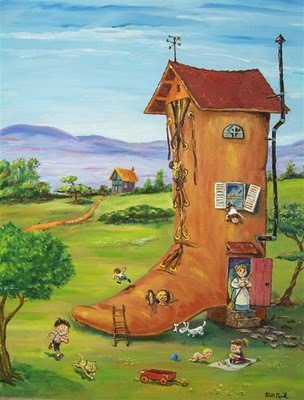 Your boot abode is totally fantastic and so very unique!! You did an outstanding job! Can't wait to see the occupants. Hi Sharon! I love your project. I'm a writer at Apartment Therapy and would love to feature your boot dollhouse with links back. Can you contact me at bethc@apartmenttherapy.com? I'd need a photo of the whole house that's 540 px wide. Thanks Beth! I sent a message to your email. I just saw this pinned on Pinterest which led me to Apartment Therapy which led me here! This is amazing. I have always been a fan of The Old Lady Who Lived in a Shoe and this fits perfectly. My 7yr old has a ton of tiny little dolls and fairies. We were looking for something to build a new fairy house out of and I think this would be perfect! Thank you for sharing. Hello again Chrystal, I enjoyed your bookshelf story on pinterest and it's so nice to see you here on my blog! I'm really happy you found this and it sparked some ideas for you. I find that the things I build with or for my kids are the things they love the most. And a nice keepsake for them to have when they get older too. I wish you and your little one all the best and lots of fun building! Thank you for your inspiration. I used your boot idea and entered two interpertations of the boot in our State Fair. One of them won 1st place and Division (dolls) Champion. Since we are a military community, I entered a white bunny boot in the Recycle Reuse Division and received a 2nd place ribbon. Thanks for a really fun idea. Wow! I am so glad to hear that... amazing! If you are on facebook and don't mind sharing stop by my facebook page "Dollhouses and the Things That Go In Them" and post pictures of your housess, I would really love to see! I don't have a facebook page, but If you want, you can send me your e-mail and I will e-mail you the pictures, You may post them. Hello again Penny, I just sent you an email. Looking forward to seeing your pictures. you have given me so many new ideas...thank you...I make fairy houses but only use clay...I will be making a new fairy tree house this using your ideas..wish me luck and keep those posts coming on you tube...your great.!!! OH WOW!!!!! WELL DONE SHARON!!! I love your Arigurumi to Go website and just discovered this one too…they're both really amazing websites so THANK YOU!